The Angriest: Star Trek: Voyager: "Death Wish"
It is 19 February 1996, and time for another episode of Star Trek: Voyager. 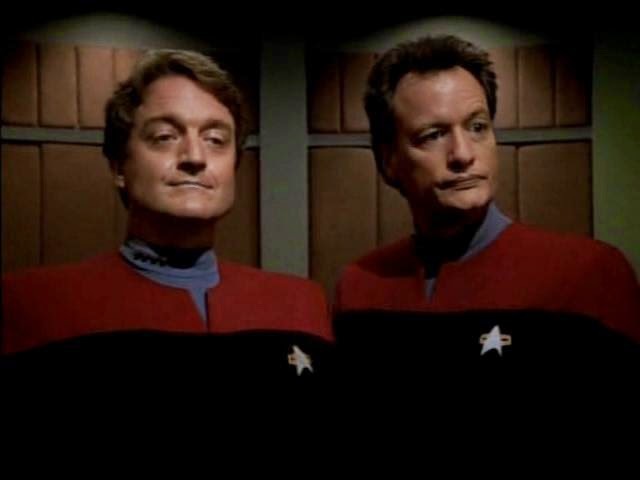 While investigating a strange comet in deep space, the crew of the USS Voyager accidentally free a trapped member of the omnipotent Q Continuum (Gerrit Graham). Soon afterward another Q (John De Lancie) arrives to apprehend the prisoner. His crime? He - a member of an immortal species - wishes to commit suicide. The character of Q (the De Lancie version), who debuted along with the rest of Star Trek: The Next Generation in 1987, was a fantastic foil of Patrick Stewart's Captain Picard. 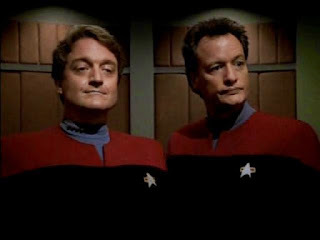 When Deep Space Nine launched, Q made one guest appearance during the first season which struggled to make the same impact. Tonally he simply did not fit the darker, more cynical style of Deep Space Nine's characters and storytelling. Not to let the character go to waste, the Star Trek production team now introduce him to Voyager - he is not much more successful here, to be honest. The problem is two-fold. Firstly, Q and Picard seem very closely linked. They banter well together, and the chemistry sparkles. When the script attempts the same between Q and Janeway, it simply reminds the viewer of better chemistry with Picard. It feels like a weaker copy. More, it is regularly and gratingly sexist: it wasn't funny or acceptable in 1996, and it is not any more acceptable 22 years later. Oddly enough the chemistry that does spark is between Janeway and the other Q: the one on a suicidal quest when she meets him. A series of episodes exploring that particularly combination would have delivered stronger dividends. The typical Q hijinks continue here - erasing all of the men from the ship for a minute, transporting Voyager to the Big Bang, and so on - but they feel overly busy and tired. The whole episode feels contractually obliged rather than the result of an enthused writer's pitch. What flashes of originality and proper humour that do appear are fleeting and insufficient to save the whole piece. Sadly the funniest surprise of the episode is spoiled by the opening credits. To its credit the episode's conclusion is far bolder than I would have expected from Voyager, but again it all feels like too little good material in the face of too much that is mediocre. In the end "Death Wish" simply is not very interesting - and that's a shame. Still, with 11 good episodes out of 18 Season 2 is still sitting on a quality ratio of 61 per cent. That is a vast improvement over Season 1.